If you have a busy lifestyle, even finding one extra hour to spare can be tough, let alone 2-3 hours in a salon chair! We’ve got the answer for those looking to save some time by eliminating some extra trips to the salon. Try the New Shadow Root effect and save time by putting in some dark overdue roots next to your beautiful platinum locks! Not to mention adding some amazing protein and shine to your hair when toning those previous platinum blonde ends with our amazing glossing treatment to top off your beautiful new color. The shadow root is one of our favorite techniques for those wanting a lower maintenance route when keeping their beautiful platinum look. By choosing a deeper tone to closely match the hairs natural color you can create an Ombre effect by pulling it slightly through the existing blonde nearest to the root and slightly pulling through the blonde creating a “color-melting” look. This entry was posted in Beauty, Salons on August 18, 2017 by admin. The Right Makeup Primer for your Skin Type. With the recent popularity of beauty bloggers and beauty influencers on social media, makeup and skin care products have been on the rise. Walking into a Sephora or Ulta can get pretty overwhelming and sometimes we don’t know where to start. All we want is to look pretty right? One of the first steps for great makeup is your base. Base consists of the skin on your face. Applying a primer after moisturizing creates a barrier between your skin and foundation. Primer creates a smoother surface for makeup application, extends your makeup throughout the day, and improves the overall look of your foundation. Now there are different primers that can benefit different skin types. If you tend to have oily skin, you most likely have larger pores. Minimizing pores are usually ideal when wearing foundation. You would want to find a mattifing primer to reduce shine and greasiness throughout the day. Also pore-minimizing primers are very popular on the market and can be found in high end stores and drug stores. Primers for dry skin are a little harder to come by. You would want to find a primer thats hydrating. Key words to look for are “dewey” or “illuminating”. However be careful as some of these primers can tend to leave skin flaky. Ask for a sample and test out product first to see how it will react to your skin. A great alternative are primer waters in which you spray before and after makeup. you can used them throughout the day. When shopping for primers don’t be afraid to ask for samples. Its the best way to know how any product will work well for you. Good Luck!!! This entry was posted in Beauty, Salons on July 11, 2017 by admin. Every year brings on new hair colors, cuts, and styling techniques in the fashion industry. 2017 trends are a mix of the “old” and the “new”, making it easy for every generation to stay on top of the fashion of today! Want to stay in style? Book an appointment with the girls at NY Hair Company and get into style the NY Hair way! 1. The Androgynous Look: Do you have high cheek bones and a sharp chinline? No more hiding behind long locks! The Androgynous look is IN! Flaunt your beautiful features with a short “masculine” style haircut with “feminine” qualities! Perfect for men, women, and fluid gender. Remember, sometimes less is more, so cut the length and get rid of any bad memories of 2016 with a fresh “new” you! 2. Faux Perms: If you want curls without the commitment, faux perms are for you! Using a curling iron that is a half inch (or smaller depending on the length of your hair) and the proper hair products (ask your favorite NY Hair Stylist for the appropriate styling products for your hair! Remember, everyone’s hair is different, and not every product is a “One size fits all” type of product!) can give the illusion of a perfectly done perm without the permanent effects of a perm! Rock the curls with confidence, and remember, don’t pick them out or run your fingers through them to keep the perm look! 3. Forward Bangs: No more romantic sweeping bangs! 2017 is bringing edge back to the fashion industry! Blunt or textured, it doesn’t matter which, these bangs are in and here to stay! The best way to style them is to use a blowdry thermal protector (consult your NY Hair Stylist for the appropriate products for your hair type and texture. Like stated above, hair products are not “one size fits all”), apply to damp bangs, and round brush forward with a large (between 1.5-2 inches) roundbrush to get a smooth edgy look (anything smaller will put too much curl to them and give them too much volume). It’s time to conquer 2017 with a BANGin’ new look! 4. The Low Pony: Last year it was all about the top knot and messy buns, this year it’s the low, sleek ponytail! The easiest look to master and accessories, this style is a go to for anyone who needs a easy to do look! For the best results, flat iron with your favorite thermal protector, pull all of your hair back to the bottom of your hairline, wrap with an elastic (or your favorite scrunchie! ), and use a light weight serum for any flyaways around the face! The low pony is perfect for the once a week hair washers who need something simple and stylish when they hold out that extra day before shampooing! 5. The Classic Bob: Think of the roaring 20’s! The one length, over the shoulder style, perfect for straight, wavy, and curly hair, the bob is back and here to stay! A-lines are now a thing of the past! Keeping it simple and sassy seems to be the theme of 2017. There are many ways to style a classic bob, so don’t be fooled by the length of the look! It can be smoothed out with a thermal spray and flat iron, roughed up with some paste or wax styling products, or curled with some hair spray and thermal guard. Ask your stylist at NY Hair Company for the right products for styling to go with your natural hair texture and cut the length for this fun, in style look! 6. Bold Cool Tones: Pastels? Who has time for that! The innocent look is out, and is being taken over by the bold cool tones of Emerald Greens and Royal Blues. Cool tones are in this year to go with the more “punky” cuts and styles that have taken over 2017 (read back to bullet points 1-3). The best part is, these colors can be used in multiple ways! Do you have dark hair and hate the idea of lightening your hair to platinum for these colors? The oil slick is perfect for you! With this look, your hair will barely need lightened (less processing means less damage if done correctly by your stylist) and the colors will be less noticeable (perfect for the working professionals) unless in the sun! Once in the sun, you get a deep rainbow effect (like an oil slick, hence the name)! Want your hair brighter and more intense? With proper care, your NY Hair Stylist can lighten your hair to a blonde and apply the blue and green tones for a more “True to Color” look! Just remember, FASHION COLORS ARE THE HARDEST COLORS TO MAINTAIN. These colors will have you in the salon one to two times a month for refreshing appointments, so if you want to avoid fading, be sure to book every two to four weeks with your stylist for your appointment to keep your color looking as good as the day you first colored it! 7. The Shag: Shout out to the 70’s! The shag is back! Not to be confused with the Mullet, the shag is an extremely layered haircut with an overload of texture. Remember Joan Jett from the Runaways? Her hair cut is the perfect example! This haircut is so textured and layered that it’s perfect for anyone with extremely thick hair that hates the weight of it! Thin hair, beware! Too many layers can make your hair look even finer than before, so consult with your NY Hair Stylist about how short your shortest layer can be without thinning you out. Best way to style: Either rock your natural texture, using a wax or pomade (ask your stylist which products are perfect for you) to mess it up, adding more texture to it, OR flat iron with your favorite thermal protector and mess it up for more of a spiked layer with some wax products! It’s the perfect cut for the messy “just out of bed” look. 8. Black Light Hair: Who doesn’t love Black Light Parties? It’s time to take over the town with Black Light Hair! With a simple treatment service by the girls at NY Hair Company, your hair can glow under a black light! Bold is beautiful in 2017, so be ready to party with glowing hair! Want your hair to pop more than already possible? Add some neon, black light compatible, peek-a-boos to your hair for a more extreme glowing look! Schedule your hair appointment with your favorite NY Hair Specialist today! 9. Natural African Hair: For all of my curly haired beauties, DROP THE FLAT IRON AND BACK AWAY! It’s time to rock your natural curls in all of their glory! Natural texture is in, so stop the unnessicary damage to those beautiful curls! It’s time to strengthen your hair with an Olaplex and protein treatment and break up with the hot tools! Using the proper serum and curl lotion after washing, you can bring life back to your curls and say hello to the beautiful head of hair you were born with. Using the proper treatments and products, your curls can build up their strength and reduce breakage that comes naturally to curly hair texture. NY Hair Company carries Milkshake products that were made for curly hair and Matrix Oil Wonders Rose Oil collection made for fine or curly hair to reduce product build up. Consult with your stylist to see which line is perfect for you! 10. Hair Exfoliating Services: You may have noticed NY Hair Company is now carrying a new Biolage line called Sugar Shine as of late 2016. This line helps remove build up from styling products and protects your hair color! It’s important to cleanse your hair just like your skin to remove any build up, so 2017 has become the year for Hair Exfoliation! Using the Sugar Shine shampoo and conditioner, you can effectively cleanse your hair and prep it for styling! Use Sugar Shine spray when blowing out for added texture and hold without the weight of normal styling products. Bring life and airy texture back to your hair with Biolage Sugar Shine (available at NY Hair Company)! Now that you have ten new hair trends to pick from, it’s time to schedule your hair appointment with the NY Hair Girls! Stay in style this year with a new look that the NY Hair Girls can show you how to replicate at home with the proper products and tools! 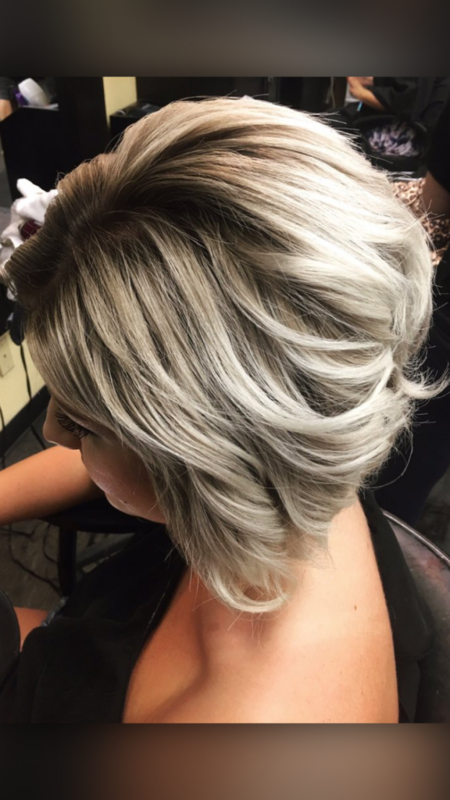 This entry was posted in Beauty, Uncategorized and tagged beauty, blonde hair, bright, hair, hair care, hair cut, hair salon, hair styling, hair stylist, haircut, hairdresser, healthy hair, light, olaplex, products, style on February 13, 2017 by admin.